So my friend got this new KitchenAid mixer the other day and today I was invited over for it’s inaugural using. Wow, it’s such a pretty thing. I’m hoping some kind soul is going to buy me one soon. Everything about it is cool. But I’m not getting money from KitchenAid so enough spouting on it’s fabulousness. 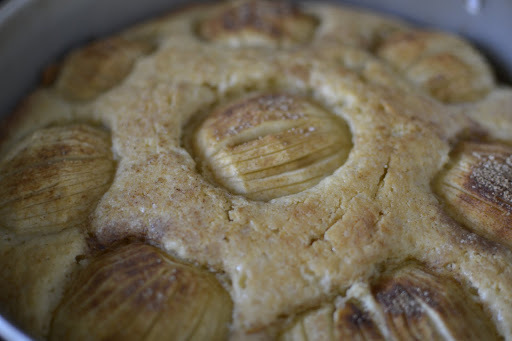 We also had an over abundance of sour apples which we needed to use so apple cake seemed a good idea and this one looked so lovely in the pictures, how could we not make it? So, this comes from the queen of Australian food, Ms Donna Hay. How awesome is she? This is from the Modern Classics 2 book, an essential for any baker. 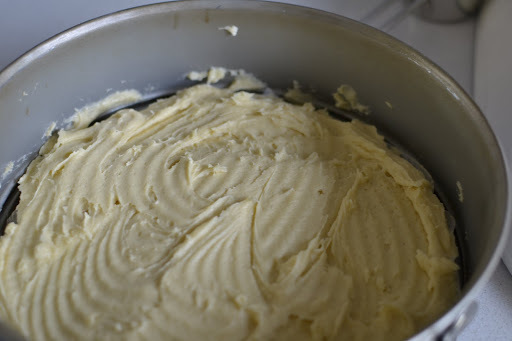 Don’t be alarmed by the batter (I was), it’s very thick and you may struggle a little to spread it out in the tin. Persevere because it’s totally worth it. 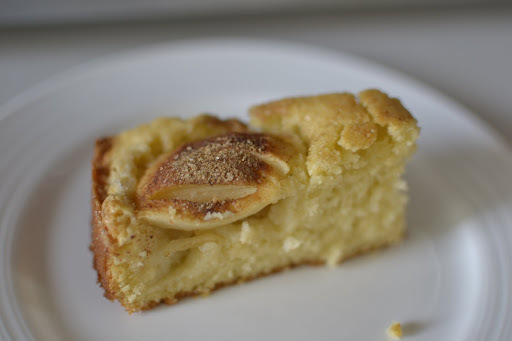 This is a good tea cake but could be served as dessert too, perhaps with some crémé fraîche? So, preheat your oven to 160C and grease and tin a spring-form tin (22cm). 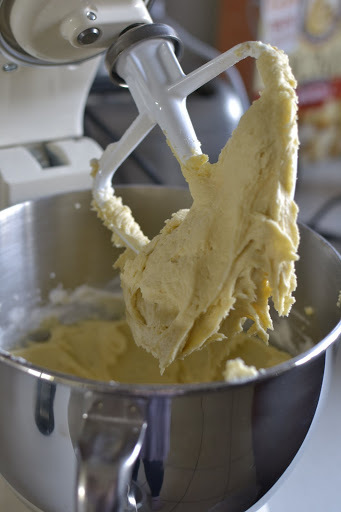 Cream the butter, sugar and cinnamon in your standing mixer until light and fluffy. Add in the eggs, then add in the flour and baking powder followed by the milk. You’ll see that the batter is very thick. Fear not, it does it’s thing in the oven. 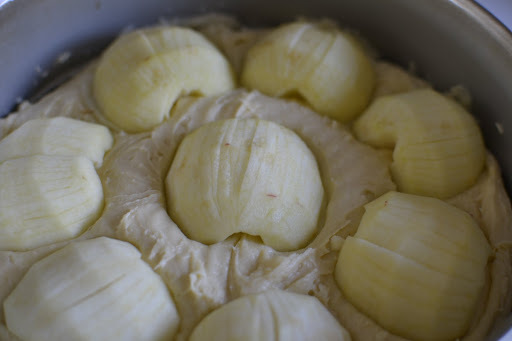 Spread the batter out over the lined tin, use a spatula for help. Now, peel, halve and core the apples. Then carefully cut slits into the apple halves, without actually cutting them apart. (You want half apple pieces with slits, not pieces of apple.) Place these over the cake batter, pushing them in a little. 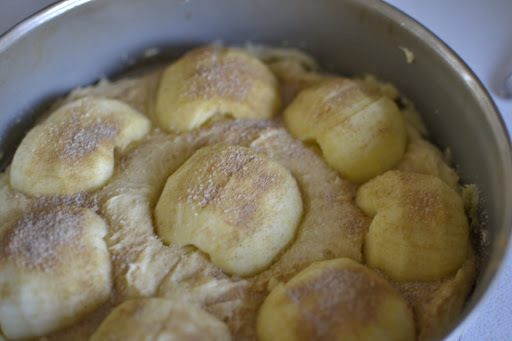 Mix the cinnamon and sugar together and sprinkle this over the apples. 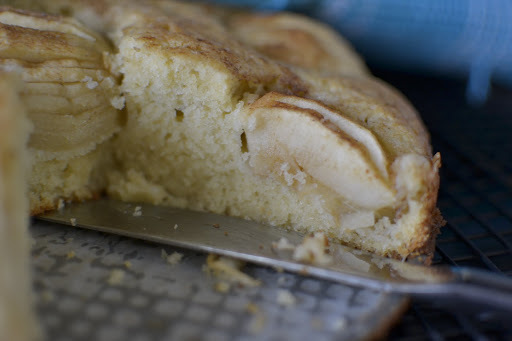 Bake this for 50 minutes. Then, if you feel inclined you can glaze the cake with apricot jam before returning it to the oven for another 10 minutes. We didn’t have apricot jam so we skipped the whole glazing debacle and just baked it for the full 60 minutes. It was glorious.